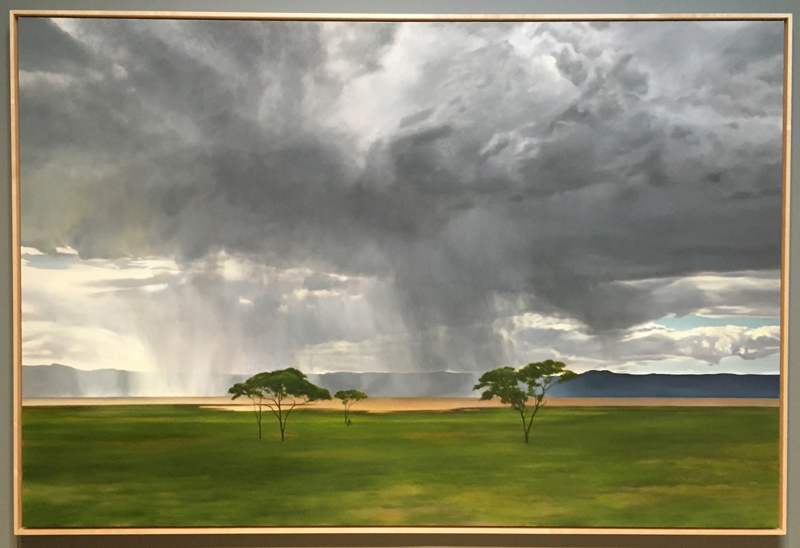 Today my husband Bill and I ventured downtown DC to The Phillips Collection to see Seeing Nature, a visiting exhibit of landscape paintings from the collection of Paul G. Allen. My techie friends will know Mr. Allen as a Microsoft founder. When I first saw that this collection was coming to DC I declared it as a must-see event for me as an aspiring landscape artist. It did not disappoint. The show spanned five centuries of landscape painting. I love the impressionists, but there were others both before and after the impressionists that I also loved. Here are a few of my favorites. 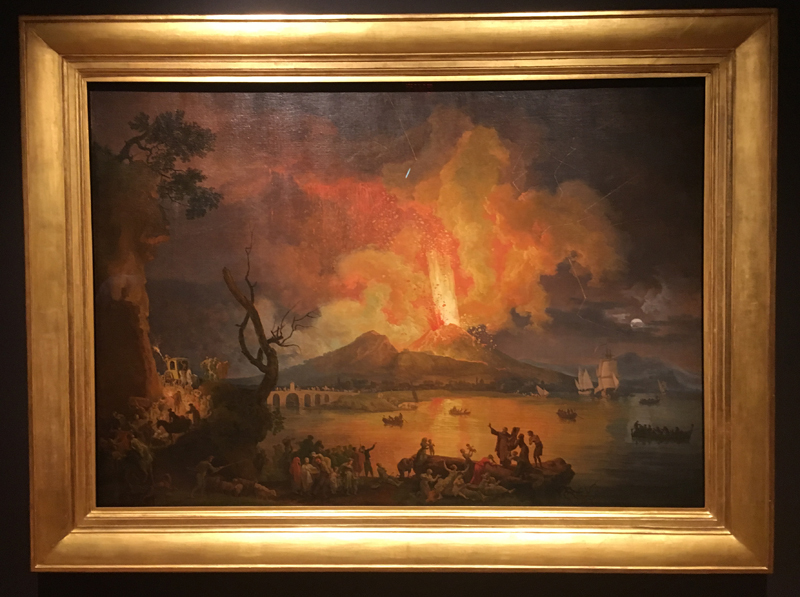 This is Pierre-Jacques Volaire’s Eruption of Mount Vesuvius. This dates to the 18th century when Vesuvius was very active. Going out at night to see it was a popular activity. We both really like the way he captured the light in the clouds and on the surface of the water. 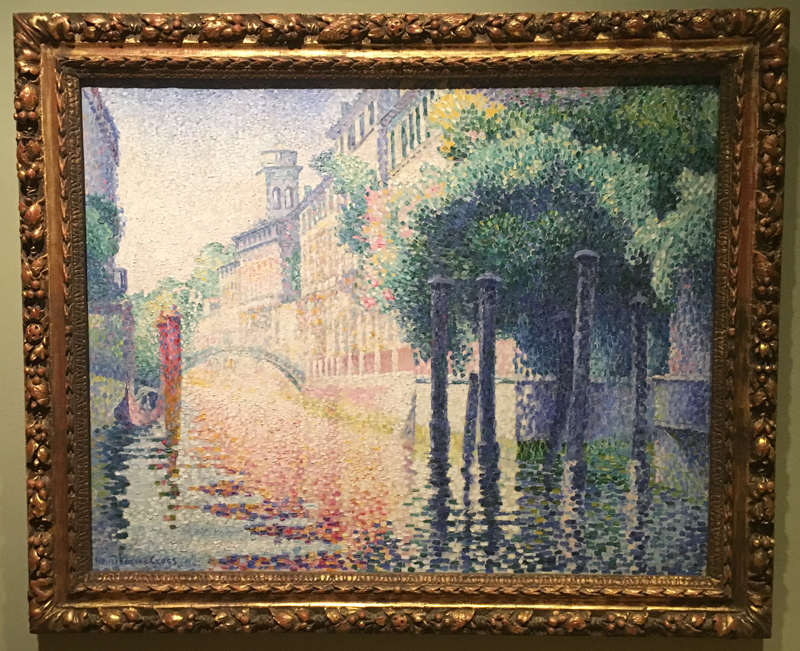 I really liked Rio San Trovaso by Henri Edmond Cross. Oddly, his name didn’t even appear on the list of artists in the advertising and handouts. This is a beautiful work. I’ve always liked pointillism. The reflections in the water are fabulous. 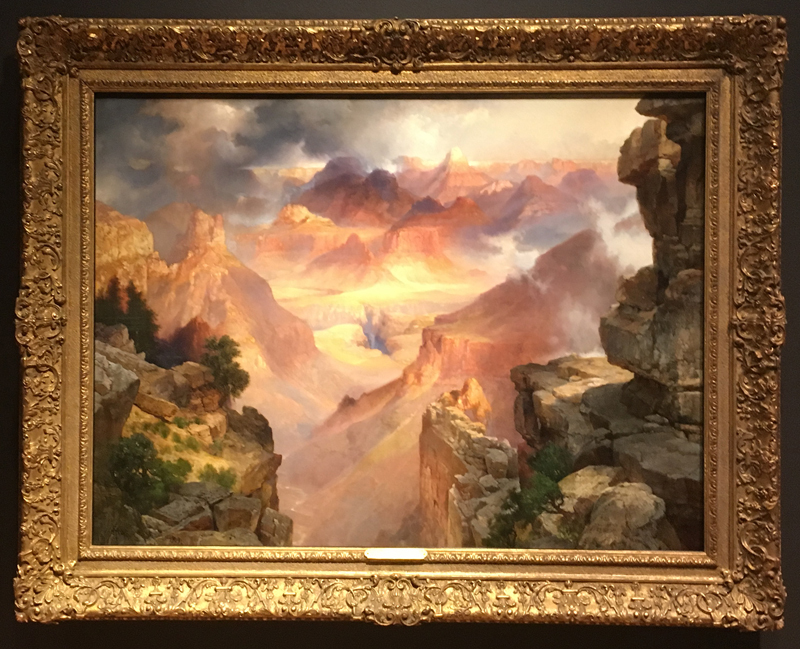 This is Tomas Moran’s Grand Canyon of Arizona at Sunset (1909). I really like the colors and the clouds and shadows. The realism in the foreground is beautiful. This is a modern piece (2008) by April Gornik called lake Light. It almost looks like a photograph. The rain clouds are fabulous. I also love the contrasting colors of the sky, the blue mountain ridge and the green grass. Then there were the Monets. I saved the best for last. This first one is called En Paysage dans I’île Saint-Martin. I confess that I did not take this photo – I went through at the end taking pictures and somehow missed this one. 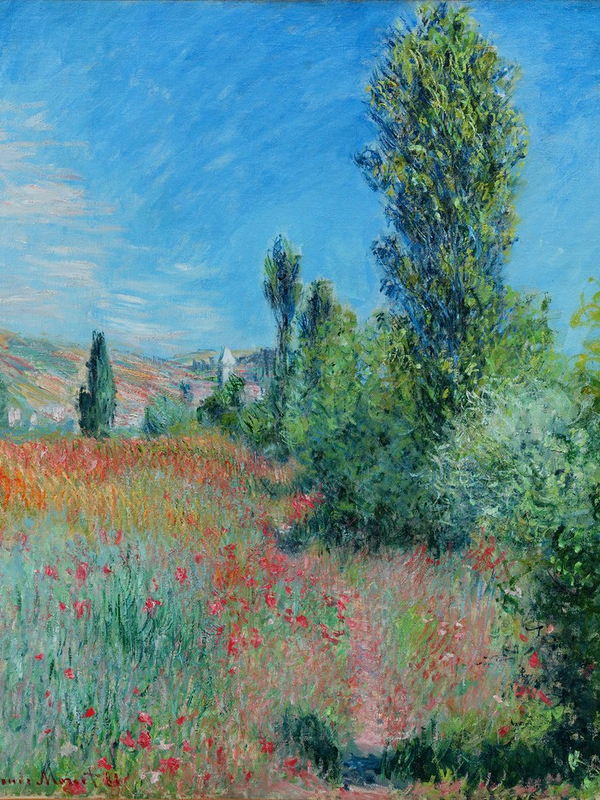 I still wanted to include it because it is an early Monet (1881) and the style is quite different from his later works. The brushwork was very detailed and the colors were bright and contrasting, characteristics that were unusual in a lot of his later work. 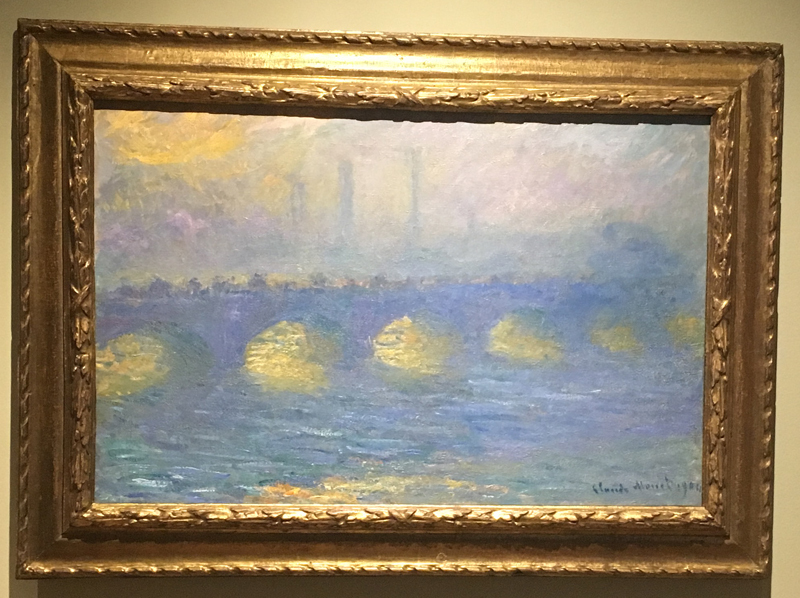 This is the Monet’s Waterloo Bridge which he painted many times. I didn’t get a date on this one but I think it’s from the early 1900s. This was Bill’s favorite. I also really like it. I especially like the way he captured the yellow light under the bridge. 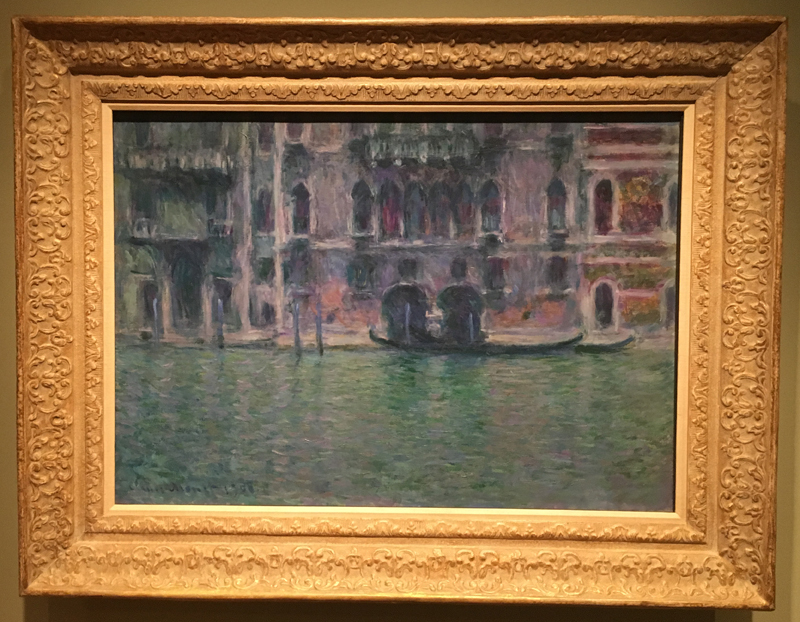 This next Monet is La Palis Da Mula in Venice. I also didn’t get a date on this one but I believe it was also from the early 1900s. I really liked the colors, especially the use of purple in the reflections on the water. Finally, This is Le bassin aux nymphéas (1919). 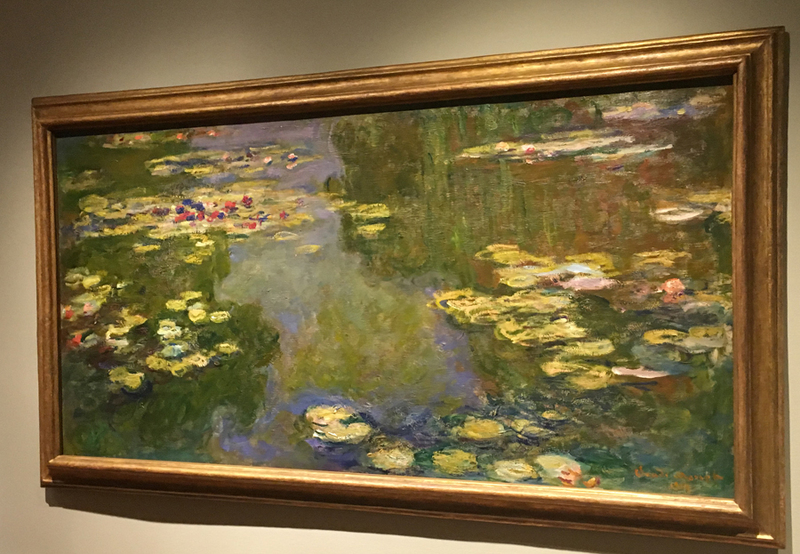 It’s very different from a lot of his water lily paintings in that there are more bright and contrasting colors. I also thought the reflections were exquisite. I am now totally inspired. To my DC friends who are art lovers, I highly recommend finding time to see this show. It runs through early May. It was time to finish the last season of three ridges. I’d done summer, spring and fall. I actually did do winter but with ice on top and clouds in the valley. It is also stunning in the snow. The photo I did this from was actually from a few years ago. Unfortunately, we weren’t in the mountains for the spectacular storm we had a few weeks ago. It doesn’t matter though. More than about a foot of snow (which happens fairly often) and the mountains become a winter wonderland. This painting shows a beautiful clear, dark blue sky in contrast to the white, new fallen snow. The mountains in the distance have snow, but also the dormant trees making them an icy purple color. The trees in the foreground were very red on the top – the color of the twigs, but the larger branches were covered in snow. The fence on the right challenged my engineer’s brain. I worked hard to paint the shapes and colors, and not to focus on the thing it was supposed to be. I hated it while I was painting it, but the result was quite good. It shows the shadows and light and captures the illusion of the deep snow. I also had fun with the shadows and light in the foreground snow. The seedlings and grasses poking out from beneath the snow helped add to the interest of the scene. This painting is 24×12 on canvas. Now the four seasons are complete. Does that mean I will stop painting Three Ridges? No way! It looks different in the color and the light of each new day. I need to branch out more, but I will never tire of painting Three Ridges.